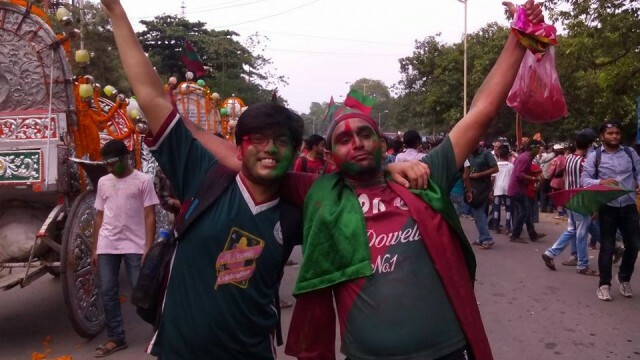 I have been watching Mohun Bagan play since the last 15 years. It is my dad who instilled the passion , emotion and love for the mother club. As a matter of fact , I witnessed many memorable moments and success of the club , albeit the last 5 years was like a barren land. This year’s victory will be special to me because of many things. First ,football experts and critics never thought that this Mohun Bbagan team could create history and after 5 years of trophylessness it was right to think so after a disappointing show at the federation cup once again. Thousands of supporters thronged to the airport with colors , crackers , flags to make the celebration worth remember . Some were crying , still couldn’t believe what had happened and some danced their way to the club ground . It was such an outstanding and unforgettable moment for all Bagan fans who found utter happiness , satisfaction and swelled in immense pride. It was a great homecoming for the gallants. Thanks team Mohun Bagan.